Peaches are one of the most popular fruits eaten. There are many varieties of peach trees that can be grown from USDA planting zones 5 or 6 through 9. The trees are capable of providing bushels of healthy fruit when they reach 3 or 4 years old. Starting a peach tree from a pit is not difficult, but does take a little time. Also, the fruit that grows from that pit will probably not be the same as the one you took the pit from. For best results, use pits from many varieties of peaches to get one or two to germinate. Clean the pit after removing it from the peach by scrubbing under warm tap water. Remove all the flesh on the pit. Leave the pit on the counter or windowsill overnight to dry. If there is any flesh still on the pit after drying, repeat the scrubbing and drying process. Place the pit and slightly damp peat moss in plastic zipper-type bag, leaving it open just a tiny bit. Place the bag in the refrigerator. Remove any apples or bananas from the refrigerator or the ripening gas from them will cause the pit to rot. Check on the pit in about two weeks to make sure it is not completely dry. If it is, add a tablespoon of water, shake the bag and place it back in the refrigerator. This treatment takes at least six weeks; leaving the pit in the cold for eight weeks is better. Remove the pit from the bag, once sprouting takes place and roots start to develop, and plant it in a 4-inch pot with drain holes. Fill the pot within 1/2 inch of the top with potting soil mixed with a handful of compost. Water the soil to moisten it and place in a sunny, warm location. Keep the soil evenly moist to encourage root growth, but not soggy or the roots will quickly rot. Plant the seedling outdoors in the spring when all danger of frost is over. Plant the seedling in a location that receives full sun and drains well. If you live in an area that has cold winters, plant on the south side of your home for some protection and extra warmth for the young plant. Apply a fertilizer made for fruit trees in the spring and again at the beginning of fruiting. Follow manufacturer’s directions on amount to apply. 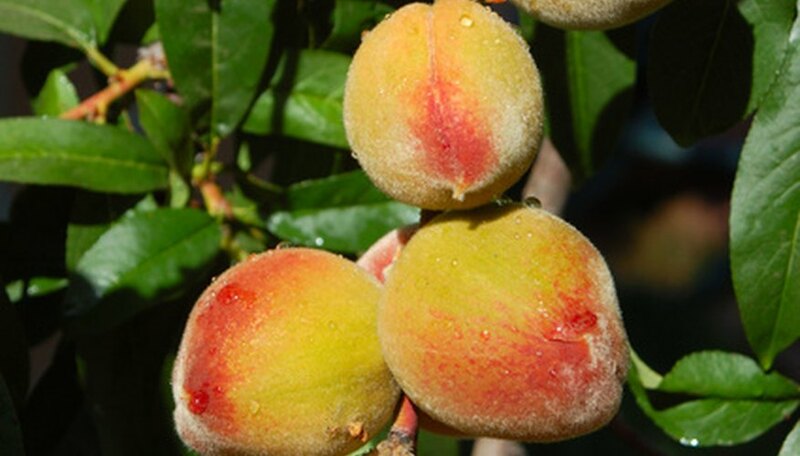 Michigan Peach Sponsers: What will happen if I plant a peach pit?